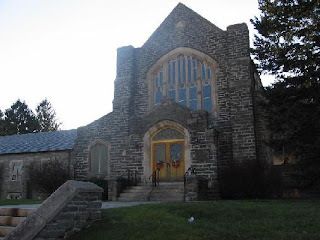 I became the pastor of Tully Memorial Presbyterian Church in Sharon Hill, PA in January of 2005. Sharon Hill is one of the boroughs in the first circle of suburbs around Philadelphia. The city of Philly line is about 3 miles from my house. And that part of Philly is the ghetto. Basically your question here is how do you start a new church within the walls of an old church. On the plus side, you already have a church building, and your salary is covered. On the minus side, nobody wants to join a retirement home church. The cult of youth and all that. The mental model you want to have is not merely community outreach but brand new church development. If your current members embrace the vision of leaving a legacy they will help you, and you won't even have to do it off line. But new church development is a high energy task, not something folks over 70 have enough of. It will have to start by meeting at odd hours. Maybe even in a local high school or something. You need some young outside volunteers to come help you bootstrap the operation. To provide a seed around which the new church can aggregate. People who will make a 1 or 2 year mission outreach commitment to commute then go back to their own church. It may even need its own session and board of deacons and articles of incorporation. But the new church you are going to start has the good fortune that it is going to inherit a beautiful church facility and a great endowment. So when the time comes, you start meeting in the current church building but at a different hour than the current worship service. In due time you join both congregations and services and voila, new church from the roots of the old.